Thallus: crustose, leprose to leprose-granular, composed of mainly farinose, ±globose goniocysts 10-35(-60) µm in diam. surrounded by an incomplete wall of irregularly shaped fungal cells; numerous, large (up to 15(-25) x 15 µm) colorless crystals not dissolving in K present in squash preparations surface: bright yellow-green, rough photobiont: Trebouxia-like; cells up to 10 µm in diam. Apothecia: convex to ±globose, sometimes tuberculate, lacking a thalline exciple, up to 0.36 mm in diam. disc: yellow-orange exciple: not evident epihymenium: with small crystals not dissolving in K hymenium: colorless hypothecium: colorless asci: mostly cylindrical to clavate, 16-20 x 5-7 µm, often immature ascospores: hyaline, simple, 4-5 x 1-1.5 µm, ±oblong Conidiomata: unknown Spot tests: all negative; thallus UVLW+ dull orange Secondary metabolites: rhizocarpic acid and unidentified pigment (trace). Substrate and ecology: on rocks in shaded and dry microhabitats such as rock overhangs and walls in oak woodlands World distribution: North America, South America, Europe, Asia, Tasmania, New Zealand, and Hawaii Sonoran distribution: Arizona (Chiricahua Mountains) at 2070 m. Notes: The present Sonoran material comprises only one specimen. Although fertile, observed mature asci with spores were few; in other parts of its range it is often sterile. The ascospores are characterized as 4-7 x 1-2 µm and oblong-ovoid, the thallus may be ±areolate, the photobiont may rarely be Stichococcus, and it may also occur over bark and plant remnants in cavities (Coppins and Purvis 1992). 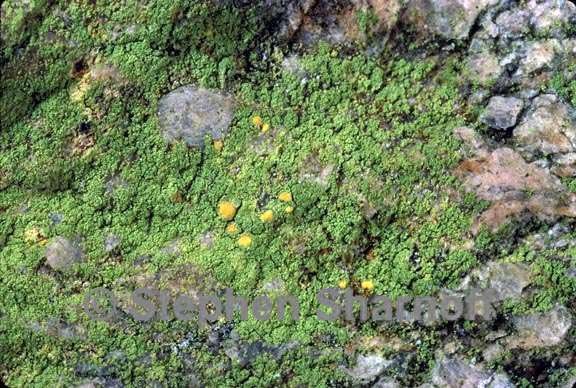 Sterile specimens of Psilolechia lucida should not be confused with similarly colored species such as Chrysothrix species and Chaenotheca furfuracea which either contains other pigments or have diagnostic substances in addition to rhizocarpic acid.